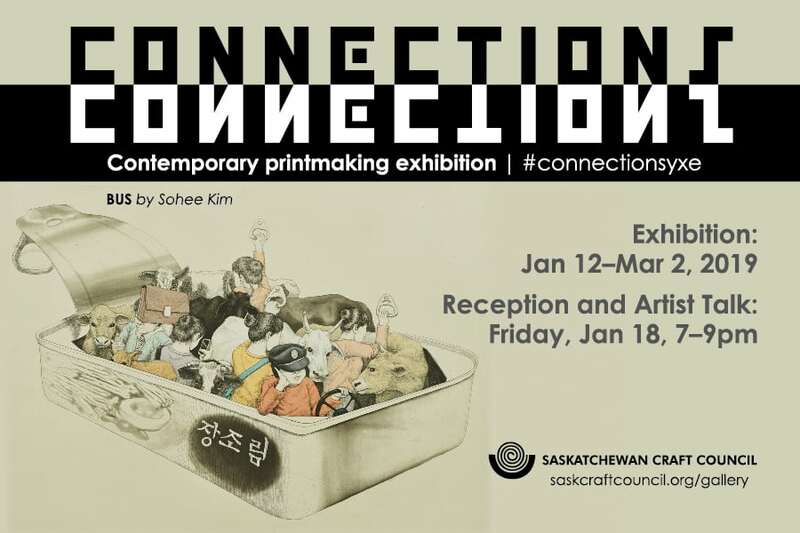 The contemporary printmaking exhibition Connections at the Saskatchewan Craft Council is like none other in our history as a gallery. We are privileged to host prints from not only Saskatchewan artists, but artists from a printmaking collective in Seoul, South Korea! The Print Art Research Centre (PARC), run by owner/operator Chinwoo Nam and assistant Ryn Lim, is a printmaking and art supply organization in Seoul with 130 members. This centre is independently funded and run from contracts with advertising companies, for which Nam designs and produces graphics for shoes, canvas bags, chocolate bars, greeting cards, and more! Left to right: Ryn Lim and Chunwoo Nam (on screen) speaking with Monique Martin and Michael Peterson. idea of an exchange blossomed into Connections. SCC Gallery is filled with a mixture of prints: small, large, black and white, colourful, detailed, blurred, and bold. It’s interesting to see the juxtaposition between the Saskatchewan and the Korean printmakers’ work. Featured pieces are an assortment of landscapes, cityscapes, small intricate designs, creatures, and critters. 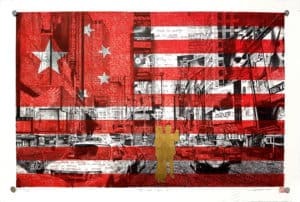 There is also an array of techniques used in Connections: silkscreen, etching, linocut, lithography, and even three dimensional prints! 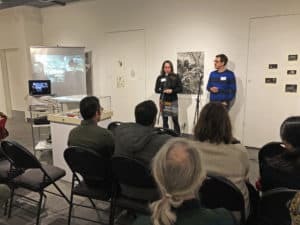 The Artist Talk from Lim and Nam’s perspective. 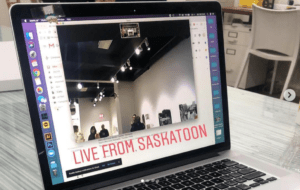 As part of our Reception and Artist Talk, Nam and Lim were kind enough to wake up in the wee hours of the morning (6:30 am in Seoul) to speak with us in Saskatoon at 7:30 pm. The artists, through the “magic and wonder” of online communication, were able to tour us around their new 2,000 square foot studio space, explain to us how their collective functions, and how they have grown their business since 2012. Both artists were so warm, kind, and welcoming; offering an open invitation to visit their space (whenever we happened to be in Korea). Connections runs until March 2, 2019. Come join us at the SCC Gallery to enjoy a viewing of this unique exhibition!